It’s a Container Store dream for sure because I can think of a lot better things to spend $800 on than some shelves, and since that is the case, I am wondering where I should start!?! For the last month, Craft Zine has been posting all sorts of info about how to get organized and they also have been showcasing some craft rooms of popular artists. Others, like Jennifer Perkins, have been working on cleaning their craft spaces, too, and that has also given me a fair amount of inspiration. I’ve been collecting some of these ideas and I wanted to share a few today. I plan to put some of these to use this month as I work through the mess that is my craft closet. One thing I know full well is that I need more organizational bins and boxes. I need them to hold all the paint, the glue, the random fabrics remnants… Well, The Sassy Crafter is speaking my language as she writes about all the over priced storage bins available to buy (hello Container Store $800 closet). In her blog, The Sassy Crafter shows us how to take regular boxes and cover them with wrapping paper to make them all coordinate. It’s a great idea for me especially because I would love to have things coordinate, but I can’t afford to drop a bunch of moolah just to get that look. 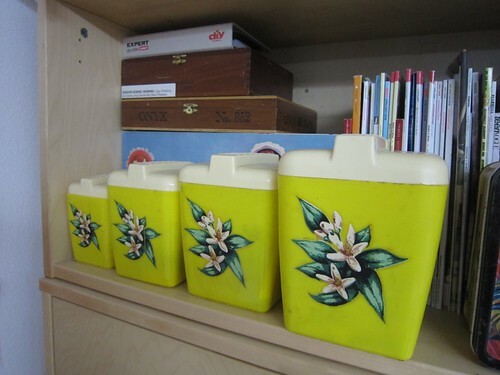 And, if you want to take this project one step further, so you know what you are actually keeping in those boxes, Craft Zine has a How To Tuesday post covering how to add style to your storage. I think if you’re going to take the time to cover your boxes in wrapping paper, you may as well take the time to tag what’s inside, right? Another way to organize things which seems to be fairly popular lately is by using magnetic storage tins and hanging them on your wall, or inside a door, or where ever you want them. I have seen this type of idea in several magazines, but Craft Zine, in another great How To Tuesday, shows us how to make a magnetic organizer, and what I really like about this one are the little “cups” for holding glue bottles, buttons, etc. I actually already own a couple of magnetic strips and tins from Ikea, so this little project is one I feel well on my way to tackling. I have one more idea I love from Craft Zine before I move along- mosaic fabric covered cork boards! I don’t have any cork boards anywhere at all in my craft room right now. My closet has one of those ribbon board memo holders, but it is so full of stuff. I really like this cork board idea. All the little circles make me think I might use each one for a different thing and even make my cork circles organized! It is a fun idea for sure, and I can see my self putting these to work in my craft room. Over at the Naughty Secretary Blog Jennifer Perkins has been working hard (much harder than me!) at getting her craft space cleaned up and organized. Yesterday she posted a great gallery of photos of reclaimed, revamped, and reinvented craft studio storage solutions. 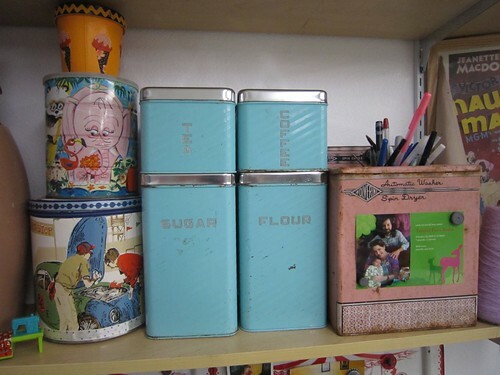 My favorite solution by far is her use of old kitchen canisters. I have a pretty big collection of these myself, something like 8 full sets, and right now they just line the tops of my kitchen cabinets holding nothing at all. I’m going to pull a few of them down right away and put them back to use in my craft room. I know I have bottle caps and buttons and bezels galore that I can pour into these newly repurposed crafty containers! So, there are, of course, lots of ideas floating around out on the internet about how to best organize a craft room. In my search I also came across several books that I think might help in my quest. 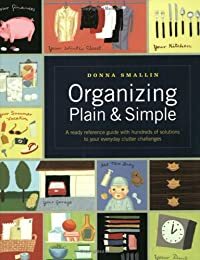 Organizing Plain and Simple is a book that really looks like it has ideas I might be able to put to action. In addition to having ideas about how to organize closets, it also has information about how to organize finances, and find balance between work and home life. I’m adding this to the top of my list of must read books. Another book that looks to be really helpful is Organize Now! A week-by-week guide simplify your space and your life. Not only does this book look really helpful, there is also an accompanying website, Organize this Life, and blog by the author Jennifer Ford Berry. Well, if nothing else, I have lots of ideas now to help get myself started towards organizing my craft closet. I hope to get my hands on a couple organizing books and I hope to get seriously started on the craft closet within the week. I may be and organizational outlaw now, but I plan to change this by the end of the month! If you have been following along, then you might remember that I gave myself about 2 weeks way back at the start of the new year to get my craft room cleaned up and organized before my new semester started. I hung some pictures, assembled a shelf, put things away in proper places, got my couch and table and sewing area cleaned, and the last time I posted about the clean up things were looking pretty good. Basically all I had left to do (with 5 days on my deadline at that time) was organize the closet and cart some stuff off to Goodwill. Well, I never posted about cleaning the closet because, as you have probably figured out by now, I didn’t do it! I felt like I was getting away with it because no one was holding me accountable, but then Jennifer Perkins posted on her blog at Naughty Secretary Club yesterday all the progress she has made this month and it made me feel all guilty. She was the inspiration that got me going at the start of the year and her progress has really re-inspired me to get things going again. She writes that she is going to work on craft room organization next month, and I want to do the same thing, too. Since the biggest issue with the closet is it’s lack of organization, so I’m going to use some tips I’ve been finding all over the internet to organize my closet. I’m going to share some of those organization tips in the next week or so. It’s been really helpful that Craft Zine has been posting organization tips all month long. A lot of what they have posted has been both practical and inspirational. In the meanwhile, I thought you might feel vindicated by my inability to keep the craft room orderly and clean if I showed you how much I have reverted back to how things were and how much cleaning I still need to do and organizing, too. So, as promised here are pictures of how the craft room has held up in the last month. Today I worked for a good couple of hours on the craft room. The table and the couch are now cleaned up! I really feel good because I have made an awful lot of progress in the past week and have still been crafting, too. I had to move a few things around to make room for the Yudo machine and all its supplies, so the shelf I was hoping to use for magazine storage and cute owl display has become the Yudo machine shelf. That’s ok though because it looks good in the craft room now. In fact, all that is left for me to conquer in the last 4 days before I have to go back to work is the craft room closet. I saved it for last probably because it is the worst. I’m not exactly sure where to start, but I think I’m going to have to pull a lot of stuff out so that I can sort it and organize it. I’ve already started a box to fill with stuff to take to Goodwill, and I have a feeling that I’m going to have a lot more once I’m done in the closet. are certainly more things I could stand to have- like tubs for fabric and yarn. I also need some accordion file folders to organize my paper supplies, but that’s probably going to be an “in the future” thing. Oh, but I shouldn’t keep you waiting much longer for photo updates. Here is the craft room all picked up! There are also a few pictures of the closet that still needs clean. Oh and I also just remembered the “silk screen factory” in the bedroom is all picked up, too. There’s a pic of where it was and isn’t now. I think the closet is probably worse than it was originally because some things had to be taken off the table and put somewhere, right? Stay tuned in tomorrow for some new necklaces. I am certain you are going to love the new designs! …well, everywhere except in my craft room. I did get off to a good start, but now I haven’t cleaned anything for a couple days. 5 days until I go back to work and I’m still pushing through that craft room mess. Today I did not clean at all, however, I started working on 50 new necklaces and 25 new rings. I am hoping to have them finished so I can share them with you on Thursday. I have to have a goal day, or I never seem to get stuff done! Today whilst surfing the internet I came across a few things that have basically reminded me that I haven’t been cleaning my craft room! Ha! Today, or well Tuesday (yes, I’m still awake at 2 a.m.) Craft Zine posted a Facebook comment which said, “Make Space for Crafting is our theme this month! How do you organize your craft space or projects? Do you have some great organzing tips? Tell us & include a photo if you can, we may even publish it on our site!” And I was thinking how I would love to have something to show them, but I haven’t really organized a single thing! I’ve really only just cleaned up garbage and put things on walls at this point. I’m going to do some serious organizing tomorrow just so I can show Craft Zine what my craft room looks like for that one day a year right after I do organize things. There’s another goal! Also, Jennifer Perkins, from Naughty Secretary Club, posted her progress on her own Operation Craft Space Clean Up and she is really making some progress! I have to say I realize my mess isn’t nearly as big as hers, but it feels about that overwhelming. Lastly, just a bit ago, I was reading a cute (well, the kitties and banners are too cute!) blog I just came across called Indie Fixx, and I read this great blog post from Kelly Rand of Hello Craft about taking stock of your crafty business. It is a really good article. It really made me think of how I don’t keep track of stock on hand at all really and I just make and make and then realize I’m out of this or that when a customer asks, so… another goal is to work on keeping track of my stock, both what I already have made and on supplies as she suggested. At least if I do keep track of supplies I’ll know how many bottles of super glue or little eyelets I should have laying around. And then the being organized thing will of course help me to find them. So, of course I’m not the only one out there thinking about getting their life more organized. I may, however, be one of the few who is reading more about being organized that actually doing the organizing! One final thing, this more on a craft display note, but today (or yeah, Tuesday) Craft Zine put up a fun How-to Tuesday about how to make a Jewelry tree. I’ve really been wanting a couple of jewelry trees for displays at fairs, so this gives me a good idea where to start and maybe if you just want to make one for your personal use you could do that too! I wouldn’t be able to have this in my house because my dog would chew it up for sure the second the cat knocked it over, but they will be good for fairs. Ok, I suppose if I want to have time to do some organizing tomorrow, I better get some sleep tonight! Here’s to crafty dreams.